My family had a terrible day – a day filled with fear, anger and hopelessness. It started for me at 11:36am when I received the following texts from my 13-year-old daughter, Lily. Our children having an active shooter at their school. My heart began to pound. I started shaking. I texted her back. As I called my husband, she continued to text. By this point, I’m crying as well as shaking. My husband and I have a rule in place because, as a manager, he attends a lot of meetings. If I call three times in a row, it’s an emergency. I’ve called him twice now. I quickly text my daughter back. “What? !” His reaction is immediate. “I’ll meet you at the school,” I reply and we hang up. I text my daughter as I’m looking for my keys and shoes. On the way to the school, I phone my husband. I give him the update from our daughter, but we don’t know where our son, Damian, is or how he’s doing. Lily’s in 8th grade and Damian’s in 6th grade, and they both attend Murchison Middle School in Austin, Texas. We hang up so he can phone our son. When I get to the school, there are parents waiting outside the school. I find my husband, and he says that Damian in not answering his phone or his texts. The bell rings and kids begin to pour between the portables outside and the classrooms inside. My husband and I don’t wait with the parents outside the building; we decide to go in. Inside, there are even more parents standing outside the administrative office. The noise and chaos is loud and everywhere. The kids are all talking to each other and hugging each other. My daughter and her friends find us and we have a massive family hug, but we can’t get into the office to find my son. The office is still locked with all of the lights inside turned off. We see the people through the glass door stuck on the other side. My daughter starts telling us what happened and how scary it was. Finally, the office opens and the parents stream in. There is little girl there with her mom – she’s so small that I’m sure that she’s a 6th grader – and her eyes are all puffy and red and fear is still on her face as her mom hugs her. I have to wait in line, and when it’s my turn, the administrator herself has to go get my son because they are so overwhelmed with parents. Only a few student office helpers are there, and they have all already been sent off to fetch other students out of classes. At approximately 11:15 a.m. we received a report that a man in plain clothes wearing a firearm was walking in our building. I immediately placed the building on lock down. Students and staff followed lock down procedures. AISDPD and APD officers arrived immediately to ensure the safety of all students and staff. Through the course of their investigation, it was determined that there was a man in plain clothes wearing a firearm in our building. They confirmed that he is a Murchison parent who was here on unofficial business to attend a parent-teacher conference and that he had checked in properly at the front desk but that neither me, security, nor our school resource officer was made aware of the the presence of a legally armed person in our building. We are working on a system to notify all necessary personnel in the event of a legally armed visitor to Murchison Middle School. Please know that we responded well to the incident and that all lock down systems worked. Teachers have been instructed to allow students to see their counselor if they feel the need. I will re-send my REMIND link to you all with instructions for signing up to receive real-time updates. For my husband and I, the adrenaline running through our bodies immediately turned from fear to boiling anger! A parent?! A “legally armed” parent was allowed into the school with a gun?! And not only that, but they were going to continue to allow “legally armed person[s]” in the school with guns?! Seventeen percent of Texas schools allow staff and/or board members to carry guns on to school property. At no point in the email did the principal reassure us that guns are not allowed in the school. No. He told us that they were going to put a better procedure into place to allow “legally armed person[s]” into the school with guns. Understanding that many parents were learning of the incident from their children’s text messages, I felt an urgency to notify the community that we were safe and to provide a cursory explanation of the incident, which I did. In my initial email, however, I referred to the man only as “a legally armed person in our building,” rather than as a law enforcement officer in plain clothes. This omission was due to my uncertainty as to which branch of law enforcement the man works – police, constable, probation, parole, etc. and my desire to provide you with a clearer explanation; however, I sent it before learning the information. This unintended omission confused some people and caused concerns about who can legally carry a firearm in a school. Please know that only a “law enforcement officer” can legally carry a firearm in a school. You have my sincerest apologies for this omission. It was made in my intent to get the message out to you as soon as possible. Though I was relieved to know that parents in general were not allowed to bring guns into the school, this second email did little to stop my anger. In our national discourse, we’re having the ridiculous debate as to whether teachers and staff should be armed. I can now tell you that after today’s events at my children’s school, I know beyond the shadow of a doubt that I do not want the teachers and staff armed. There is no debate for me. I do not want adults routinely walking around my children with guns, not even off-duty police officers. The NRA, politicians and pro-gun advocates have forced guns in the school with my children regardless of my feelings or views on the matter. 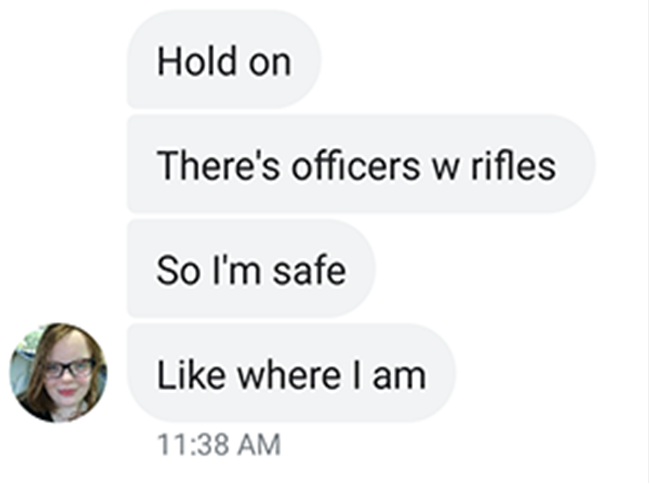 My children had a man – a man that I know nothing about – walking around their school with a gun today. The terror that I felt, that my husband felt, that other parents felt, that my children and every other child in Murchison Middle School felt meant nothing. This story was barely reported on. And that is when the hopelessness settled in. No matter what we say, no matter how many children and adults are killed by mass shootings, no matter how much fear and pain we feel as American citizens, it never changes. Year after year, child after child, life after life violently destroyed, it never changes. Our politicians will not change the gun laws. This is my tiny voice. It’s so small. In the vastness of this world, among the masses of people, my voice is so small. But I have to try. We have to try, don’t we? We have to keep yelling. “We want gun control!” Louder and louder and louder. WE WANT GUN CONTROL! All of us, together, our tiny voices becoming powerful and one in unison. WE WANT GUN CONTROL! So loud that the roof of heaven can feel our pain and our resolve and our hope for our nation and our children. You will die. As surely as you are breathing now, you will die. This life is as fleeting and as magical as your first kiss. And therefore, don’t waste it. I’m telling you this as I tell myself this. I’m being your cheerleader as I encourage myself to live out loud, to dance with every movement, to wake up. I’ve been sleeping too long, living in the darkness of fear and fantasies. My body, having been ignored as I slept and dreamed of other worlds, has dulled from years of indifference. But I’m awake now. I see the magic. I don’t know where this path will lead, but I don’t want to sleep anymore.